Dealer will always hit on soft 17 in Super Fun 21. You can split like cards, and re-split once. You can draw on split aces, and re-split them as well, though a 10-point card drawn onto a split ace only gives you 21, not blackjack. You can double down on any cards for an amount equal to your initial bet, and you can do so even after you split. After doubling down, however, you are not eligible to win with bonus hands. Bonus hands are hands of 6 cards which total 21 (instant payment, 2:1) or hands of 6 cards totaling 20 or less (instant win, paid 1:1). You can surrender, even after doubling down, whereupon you lose half your bet but stop playing the current hand. 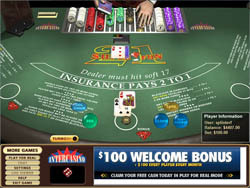 Insurance is available at a cost of one half your initial bet, so long as the dealer shows an ace. All bets push in the event of a tie. Your initial wager for a hand in Super Fun 21 must be at least 1 but no more than 500 USD/GBP/Euro. Bets are made with chips, which come in five denominations: 1, 5, 25, 100, and 500. There are several ways to win. Blackjack pays at 1:1. If you get a hand totaling 21 with 6 cards, you are immediately paid out at 2:1. If you get 20 or less with 6 cards, you always win, and area paid at 1:1. A side bet placed before the deal pays at 300:1 if you area dealt a Diamond Blackjack. Insurance pays 2:1, and all other wins pay 1:1. All bets push on a tie. The graphics in Super Fun 21 are truly super, and will knock your socks off. They are fully 3D and animated, and are as real as you can get with computers these days. You do pay for this in gameplay, which can be a bit frustrating because the cards and chips are smallish, but if that does not bother you – and it probably won’t after you see the game – then play on! The interface is standard, and there is a Turbo button to speed things up a bit if you don’t like to wait. You can even turn off the animations, but what fun is that? Because there are a couple of extra payouts in this game, and both of them pay for having 6 or more cards, it is a good idea to keep playing if you get a bunch of low cards in a row. These won’t get you blackjack so you’re not guaranteed a win, but they can add up slowly and give you some decent payouts, or even a win against the dealer. Just remember – they don’t work if you have doubled down, so don’t do it if you get dealt two low cards! The thrills just never stop when you’re playing Super Fun 21. Whether it’s getting dealt blackjack after making a higher-than-usual wager (or better yet a Diamond Blackjack! ), or maybe just barely hitting the 21 mark on your 6th card for an instant, all of these and more are possible with this game. The extra payouts and winning hands means more action, and since it all happens in an awesome, realistic 3D game, it is hard to find a better blackjack game anywhere!